While attending a birthday party at a local painting boutique, Hallie, not surprisingly, chose to paint a Tux look-alike. She showed off her remarkable memory by nailing Tux's black and white markings and the light yellowish-green color of his eyes. Hallie just knew the real Tux and the ceramic Tux would become fast friends. Unfortunately Hallie was wrong: a friendship between the two Tuxes was not in the cards. 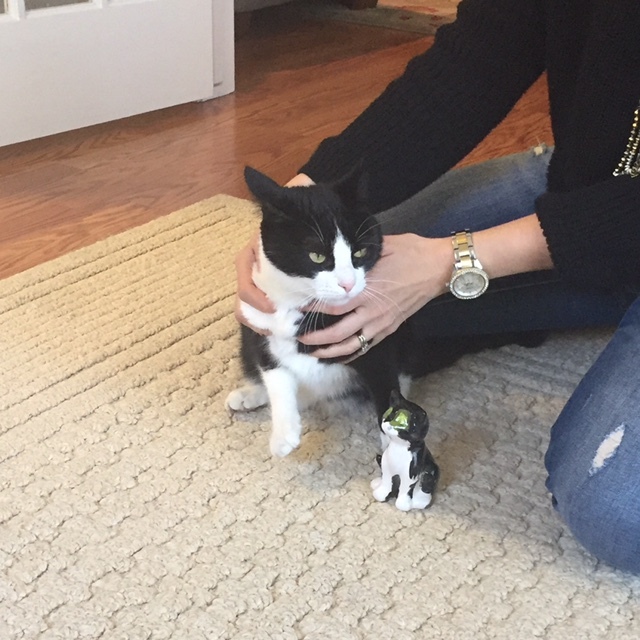 After giving the ceramic Tux a sniff, the real Tux decided he hated the ceramic Tux (perhaps he smells funny?) and went into hiding. I dragged the real Tux out from under the bed for a picture, but that the was the last encounter between these two loves of Hallie's life. I'm struck by how similar the real Tux and the real Hallie look in pictures…something about their unwillingness to cooperate and grumpy faces. I think they were meant for each other.